Creating Facebook applications is already big business online. Facebook created a special fund to invest in popular applications for their social platform and there are also several venture capital firms who are keeping an eye on the sector for the next hot or modern Facebook application to invest in. Monetizing the traffic generated from those applications is another story. SocialMedia is one of the top so called ad platforms for Facebook applications. SocialMedia offers a suite of tools and services for developers building applications that run on social networking platforms including Facebook and MySpace. SocialMedia Network’s flagship product Appsaholic sells click-throughs to other Facebook applications across a network of affiliated sites in a similar way to FBExchange’s link exchange model, but has more features and seems easier to use and has PayPal integrated. Below is some more information on how Appsaholic works. Developers become a member of the network by tracking their application on Appsaholic and adding some embed code to their application. The embed code adds an iFrame that serves paid links on their affiliates’ applications. The links go to the highest “AdRanked” advertising developer on their live bidding market. AdRank is determined by multiplying two factors, the offered price per click, and the advertising application’s quality score. The quality score is based on a function of the application’s clickthrough rate and viral growth within the network. The idea is that higher quality applications should be rewarded with cheaper advertising. This dissuades disliked apps from spamming the service. So, for example, a developer whose application has a quality score of 60 and is willing to bid $.10 per click, has an AdRank of 6. Since ads are served in AdRanked order, the developer could boost his AdRank and position in the queue by bidding a bit higher. Currently PPC rates are 10 to 20 cents. Appsaholic takes 12-30% of that revenue. The company has recently taken $3.5 million Series A in a round led by Charles River Ventures that also included Marc Andreessen (Netscape) and Jeff Clavier. Charles River Ventures had previously seed funded the company with $500,000. That took the company’s total funding to $4M. Other investors include Jim Bankoff – Former EVP Programming AOL; Ted Barnett – CEO of JamJam; co-founder and CEO of When.com; former COO of Ofoto; Jeff Clavier – Manager Director SoftTech VC; Marc Andreessen – Co-founder of Netscape and Ning.com; Mark Goldstein – CEO of LoyaltyLab.com; Naval Ravikant – Managing Director HitForge; author of VentureHacks; co-founder of Epinions; Tina Sharkey – Former SVP Social Media and Instant Messsaging, AOL, Former Group President Sesame Workshop Internet, co-founder iVillage and Jeremy Wenokur – Former VP Corp Dev, Google. There are several other startups claiming to be the top Facebook ad platform: Lookery, fbExchange, RockYou, and Cubics but SocialMedia is one of the early players when they launched their Appsaholic advertising network soon after F8. Some people are a bit skeptical about companies like SocialMedia arguing that some of the popular social networks themselves can’t even really figure out a profitable way to monetize themselves, let alone third party small companies going to become the standard way to monetize social networks by putting ads and stuff in a widget. Will they ever manage to make money? Maybe, maybe not. But the potential is huge, and if someone ever succeeds in that field, the Social Media seems in a pretty good position to be among the winners. And so, on this day, socialmedia.com was unleashed. SocialMedia was one of the first developers on the facebook platform, launching Food Fight and Happy Hour shortly after f8. To date, more than 10 million users have installed one of these applications. The services we provide to others were born primarily of our own needs in developing and deploying our applications. Through our personal learnings and experiences, we are now determined to offer a similar set of services to all developers and advertisers who care to delve into the world of the facebook platform, and all other platforms that are destined to follow. Tap into the social revolution with SocialMedia – the app network! Public information available on SocialMedia claims 1,475,837 apps installed, thus far. SocialMedia Networks is based in Palo Alto and Mill Valley, CA. Yesterday we were tipped off that both LeapFrog Ventures and BV Capital have invested in San Francisco start-up called Peanut Labs. The funding is in the $3.2M range and is the company’s Series A round. Peanut Labs helps social networks monetize, not through the traditional ad-based models, but via market researches and online surveys. The company also says that publishers — more than 70 found on social networks, applications and online communities like Facebook, MySpace, and members of Google’s OpenSocial — receive on average $20,000 per publisher a month. CEO and Founder Murtaza Hussain isn’t new to the business. Peanut Labs developed their technology based on their own efforts to monetize Xuqa, the now-profitable social network in Turkey. By expanding this business model across several social networks, Peanut Labs proves that social networks and Facebook apps can create profitable revenue streams. Peanut Labs is said to be profitable but no public information as to the revenues and profits is available, aside claiming profitability and seven figure revenues. The same is for the next year – Peanut Labs expects eight figure revenues in 2008. It can be anything between $1M and $9M and it could also mean anything between $10M and $99M respectively!? The $3.2 million cash infusion will be used for continued product development towards Peanut Labs’ patent pending market research sampling technology, which is highly effective at reaching the sought after 13-25 year-old demographic known as Gen-Y. The funding will also be used to actively service Peanut Labs’ burgeoning list of market research clients and enhance the survey-taking experience, a crucial part of Peanut Labs’ Sample3.0 technology. Found across more than seventy social networks, Peanut Labs helps web publishers create revenue streams through market research surveys. Each time a member of the social network completes a survey, the publisher earns a sum of money. Peanut Labs is a rapidly growing provider of market research services backed by the investors of Skype, Yahoo eGroups and Del.icio.us. We provide access to hard-to-reach demographics for market researchers – and are the leading provider of Gen Y sample for market researchers today. We have developed a research technology integrated across 70+ social networks and an online community that has demographically profiled, aggregated, and engages with millions of members each day. Our technology provides access to a recruitment audience of more than 27 million users. Peanut Labs has partnered with many of the most popular MySpace, FaceBook and Google Open Social applications. The company claims their network is able to reach more than 10 million users. Their platform enables publishers to better monetize their communities by allowing their users to participate in market research studies. On the other side their platform enables market researchers to gather high-quality data from Gen Y users by reaching them where they spend most of their time – on the Net. Because of their recruiting methods, their panel is free of professional survey takers. 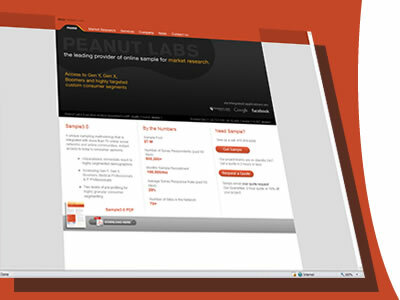 Peanut Labs enables access to hard-to-reach groups for the market research community. Peanut Labs claims to have more than 70 sites participating in their network with total audience of 27M where the daily reach is said to be 4M. The site also claims to have 58 new sites applying to join the network monthly with only 10% of them being accepted. The company also claims to be able to increase your revenues 3x – 5x more than what your are earning from advertising, which means 100,000 – $1 million in net profit for your organization in one year. To be eligible, your site needs to have an Alexa ranking of 10,000 or better. At least 25% of your users must be from the US. You must have some way to communicate with individual, registered users (such as on-site messages or emails) on your site. And you need to have some type of incentive system (point, virtual items, community rankings, premium content, locked features etc). Alexa ranking is seriously discredited so we do not understand why Peanut Labs is relying on Alexa to determine the real number of visitors a web site has. Murtaza Hussain, Chief Executive Officer Murtaza Hussain is the co-founder and CEO of Peanut Labs, provider of advanced market research services and developer of Sample3.0. In his role, Murtaza leads the company’s overall strategy and product direction. Murtaza has been instrumental in forming industry changing partnerships that bridge social media and online communities with the business application needs of the market research community. In recent years, Murtaza has been heavily involved in the technologies supporting social media, and is has developed expertise in the practice of building online communities. Murtaza participates regularly as a speaker at industry events, including the Facebook Developer’s Conference, Widget Summit 2007, SNAP Summit, and Community Next. He was most recently co-founder of XuQa.com, a leading online casual gaming community, which was built to 2M+ users and profitability. In 2001, Murtaza founded Gaming Ventura, an international entrepreneurship holding group which he has successfully been leading in his capacity as President for the previous 6 years. Murtaza is a natural inventor and web developer, leading his team to three consecutive first-place finishes in the Intel International Schools Educational Olympiad from 1999-2001. He was the captain of Team Pakistan in the International Enterprise Olympics, where his team finished third globally. For two seasons, Murtaza also hosted a national youth TV show in Pakistan that boasted a viewership of more than 10 million. He was pursuing a Bachelors of Arts in Anthropology at Williams College, MA prior to leaving academia to start the company. Other members of the management include Ali Moiz, Prosper Nwankpa, Sean Case, M. Noman Ali and Lisa Duryea. Board of Directors include Murtaza Hussain, Prosper Nwankpa, Thomas Gieselmann, Pete Sinclair and Simon Chadwick. Silicon Valley and European based BV Capital invests in new opportunities and innovations in the internet space. BV Capital’s portfolio includes companies that are significantly changing the landscape of business and communication today including Angie’s List, Cranite, and shopping.com (eBay). Enablers of great ideas, LeapFrog Ventures has invested in companies that are well positioned for high growth. Known for their commitment to excellence, LeapFrog has had a selective portfolio companies including Octel, Symantec, Intrisa, Striva Software and Netli. The company has also been named one of 50 “Companies to Watch in 2008” by the Dow Jones VentureOne Summit advisory board. Similar companies include AdFish, PollDaddy.com, Constantcontact.com/survey, surveyclub.com and BoxTticker.com, among others.